‘Spent the afternoon in wardrobe posing with the female human. Evidently there is a big conference where all the crazy cat writers and all the dingy dog writers get together to learn new stuff. My human and I entered a contest to win airline tickets and registration to go to this pawty in Phoenix, AZ. We had to use one of four backdrops and be creative. Whatcha’ think? Purrsonally, I think I rocked the bandana! 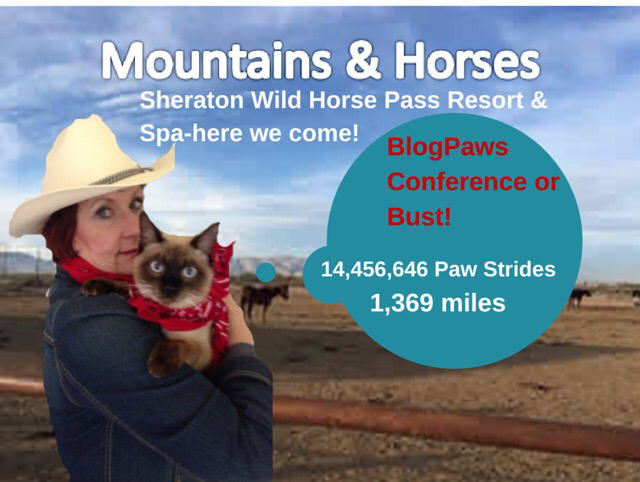 Here’s hoping we are on the way to making those 14,456,646 paw strides from Idaho to Arizona! This entry was posted in BlogPaws, Cat writers, cats, Chicken Soup for the Cat Lovers Soul and tagged Alberto, Anita Aurit, Blogpaws Conference, Cat writers, Chicken Soup for the Cat Lovers Soul, feline by Feline Opines. Bookmark the permalink.